These Sky-Watcher Wide Angle Eyepieces offer a generous 66° apparent field of view, allowing more sky to be viewed at one time. They provide sharp image right across the field. The rubber eyecups are included for viewing comfort and to keep out extraneous light. 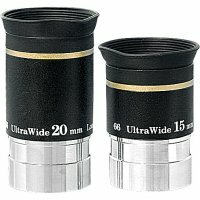 Sky-Watcher 2mm Long Eye Relief (LET) eyepiece.